Life has been full of little surprises for Hibs kid Fraser Murray over the past ten months – all of them very much welcome. He may have been a total unknown when he was handed a first-team debut against Highland League Turriff United in last season’s Irn Bru Cup as boss Neil Lennon took the opportunity to rest a string of his frontline players. 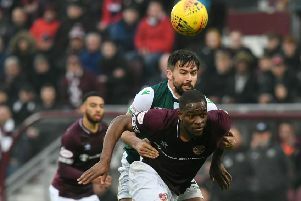 But now the 18-year-old is making everyone sit up and take notice, his latest appearance in a green-and-white shirt earning him the man-of-the-match as Hibs crushed Montrose in their opening Betfred Cup match at the weekend. It wasn’t, though, the first such accolade for the midfield rookie – he’d also been picked as the best player on the pitch in his first League appearance, a 3-2 win in the Championship over Raith Rovers in April. Admitting that at present it feels this as good as it gets, Murray insisted he won’t be allowing his head to be turned, well aware that he’s got a lot of hard work ahead of him if he is to even make himself a first-team regular at Easter Road. It has been, however, a promising start but far from having “come from nowhere”, the boy from Glasgow revealing that he’s been with Hibs for ten years, the faith being shown in him by Lennon a reward for those thrice weekly trips along the M8 to train at East Mains. “It’s going well just now,” Murray agreed. “And I am enjoying myself. But it is a matter of continuing to work hard and try to use this as a platform to push on and try to force myself into the first-team squad. Nevertheless, Murray admitted he’s already far beyond where he believed he might be at this stage in his career. He said: “I’m from Baillieston but I was scouted by Hibs when I was seven or eight and I have been with them ever since. “There were training camps in Glasgow but they stopped when I was about 13 and I started coming through to Edinburgh three times a week, training Monday, Wednesday and Friday and usually a game at the weekend. “I’ve got my dad Stuart to thank for bringing me through. We must have clocked up countless miles driving back and forward along the M8. Murray appears to have slotted in seamlessly in midfield but that, he insisted, was down to having the likes of John McGinn and Dylan McGeouch alongside him. Murray admitted his appearance against Montrose had come as something of a shock – just as each of his previous games had been. “It was a bit of a surprise to be picked against Turriff, but brilliant to get the first goal in that game and then it was not only a surprise to play against Raith but to get the man-of-the-match award. “At the weekend I knew I was in the squad but never thought I’d be playing. I was only told an hour before kick-off and again it was a bit of a surprise, but I was pleased. Speculation, of course, has been rife all summer as to who Lennon may be bringing in, every day seeming to bring forward a new name. Steven Whittaker’s return made him the fifth signing with the prospect of more to come, although Murray is delighted that as he seeks to strengthen his squad, Lennon isn’t overlooking the young talent on his own doorstep.